British indie three-piece Amber Run are Joe Keogh (vocals and guitar), Tom Sperring (bass) and Henry Wyeth (keyboards). They're known for delivering cinematic pop with a moody and introspective tone. 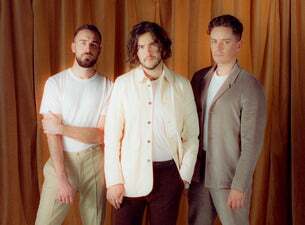 Formed in 2012, the trio met at the University of Nottingham and within their first year self-released their debut Noah EP, performing at 2013's Reading & Leeds Festival. Their first album 5AM broke the UK top 40 in 2015. The band returned in 2017 with unrivalled passion and a sound to match in their second album, For a Moment, I Was Lost, selling out their headline UK and European tours. Released to critical acclaim, their sophomore record is raw and deeply introspective with rich electronic textures.